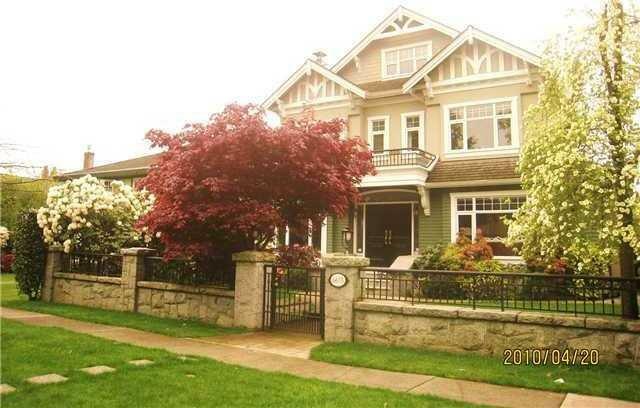 Description: ELEGANT home in Prime South Granville. Recently renovated and situated on a 50' x 125' lot, this 12 yrs tutor home features 4100 sf with 5 bedrooms (4 up all ensuite, 1 in basement), large den/office, 5.5 baths, gourmet and wok kitchen, wet bar and home theatre, huge sundeck, beautiful garden and triple garage. Quality finishes w/ mable entry, hardwood flooring, crown moulding, designer painting, high end cabinetry, stainless steel appliances, granite countertop, A/C, radiant heating, built-in speaker, security and monitoring system and more.... Bright and spacious home on a beautiful tree lined street. Close to Magee High and Maple Grove Elem., transit, shopping and parks. Buyer to verify measurement.